How is it that a hilly, almost mountainous peninsula that is an ideal environment for lush forest, surrounded on three sides by the ocean and composed of mineral-rich volcanic soil, seems almost devoid of it? Any drive through the Banks Peninsula reveals a landscape that is tussocky with very few stands of trees. What isn’t covered by grassland seems overtaken by gorse and broom, hardly forest land that you might expect in this setting. It is an unfortunate fact that old growth forest was destroyed by the Maori who set fire to the canopy to flush out game. After the Europeans arrived, the practice of deliberate burning continued, along with introducing sheep and goats and gorse that didn’t do any favors to the ecology. It seems incongruous now but the Banks Peninsula was previously the domain of two slightly overlapping, non-contemporaneous volcanoes that were last active approximately 10 million years ago. Because they were shield volcanoes, they released broad lava flows that are now highly eroded. What remains now are ridges with steep sides that radiate from their volcanic centers. The most extraordinary features of the peninsula are its two enormous harbo(u)rs, Lyttelton and Akaroa, which formed from the oceanic flooding of the two volcanic calderas. The peninsula now looks like a giant lobster claw jutting out from the Canterbury Plains. I got a breathtaking view of Lyttelton Harbour from a viewing platform at the top of the Christchurch gondola. From there, I could also see the town and port of Lyttelton that suffered so much damage in the earthquakes. Other than the views from up here, including one of Christchurch and the Southern Alps beyond it, there is very little to admire. The ground is covered in tussocky grass. All the footpaths are littered with sheep poo as these animals have free rein to graze anywhere among the hills. 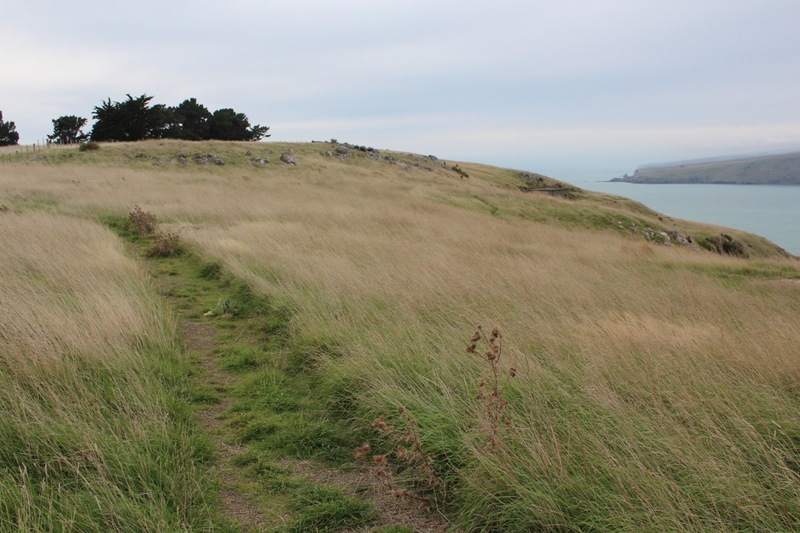 I saw a more grassy landscape at Godley Head Reserve, which once served as a military defense battery during WWII, the bunkers now abandoned and covered in graffiti. The grasses grow higher here probably because sheep browsing is restricted by fencing. There was no need for careful sidestepping along the walking paths. 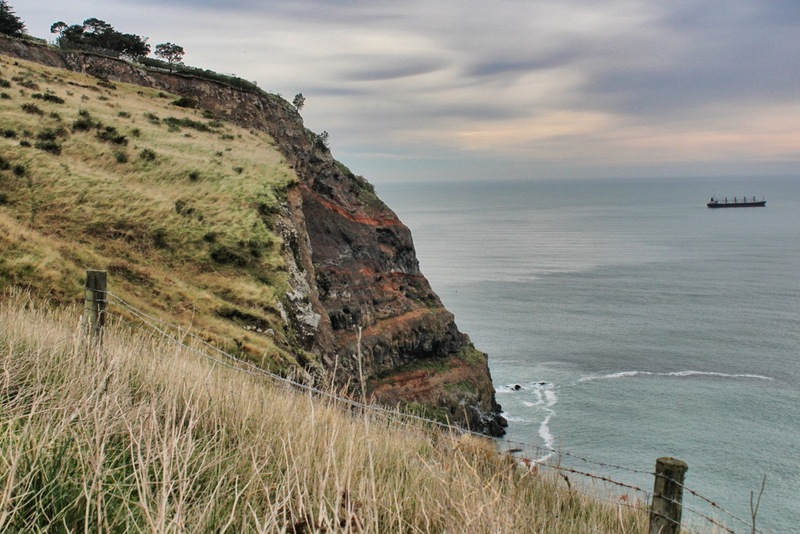 The headland is surrounded on three sides by steep cliffs that drop off to the ocean. My wife and I also took a two-day trip to the peninsula’s other side, Akaroa. The scenery changes here with greener hillsides and larger stands of trees, also some second-growth forests that suggest the promising possibilities of regeneration on the Banks. Akaroa is now a resort town, its commercial district divided by an indenting bay, that were once French and English settlements. The entire township now has a more Gallic character as all the streets and restaurants have French names, though there’s hardly a word of français spoken. A good way to see the lava flows that occurred many times is to take a boat cruise into the harbor. 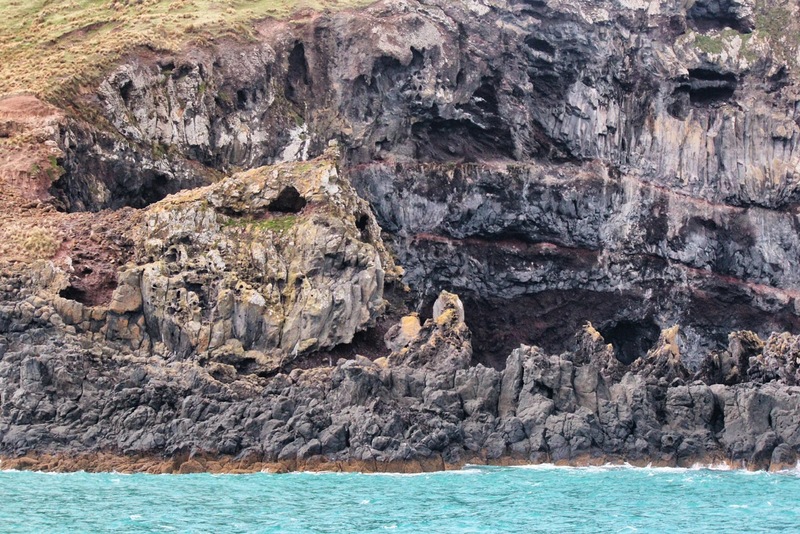 The erosive power of pounding waves becomes apparent when you notice the many sea caves along the cliff faces. 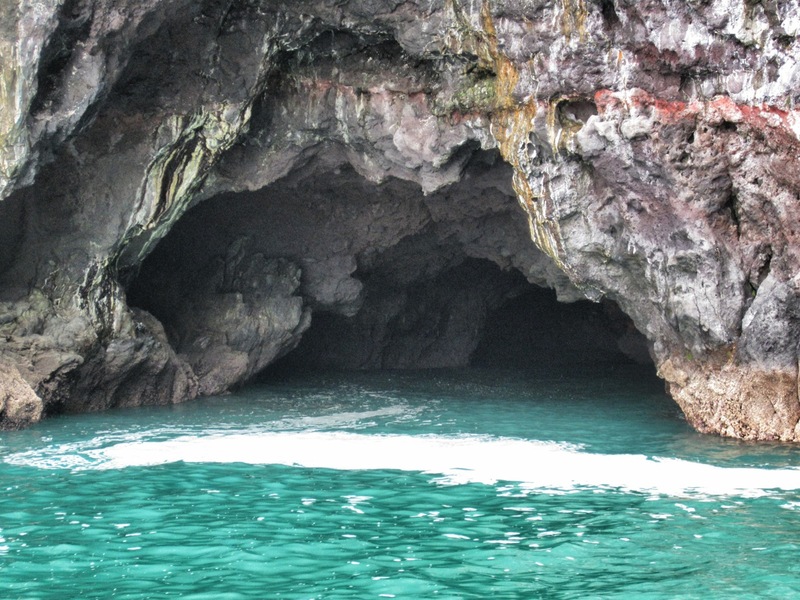 One of numerous caves in Akaroa Harbour. The Banks Peninsula experienced many lava flows. 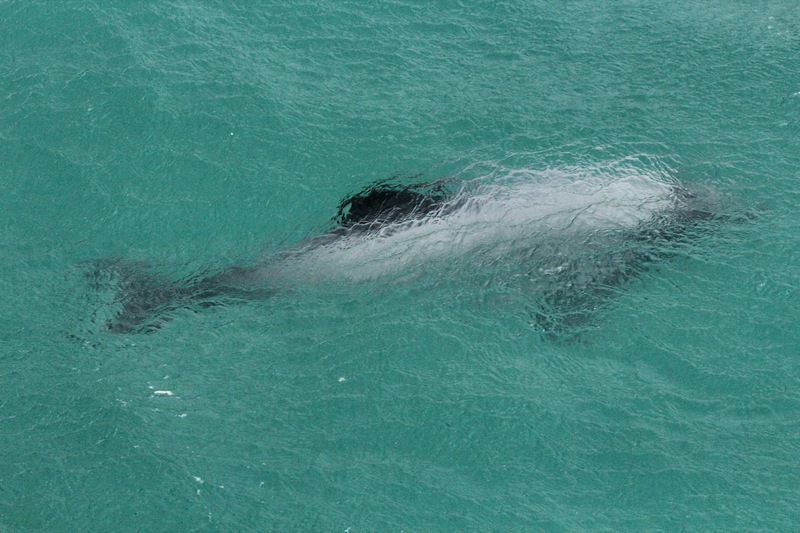 Hector’s dolphins play in the sailing vessel’s bow wave. The drive to Akaroa passes by the Kaitorete Spit. Although not technically part of the Banks Peninsula, the spit juts out from its southwestern tip for 25km, separating shallow Lake Ellesmere, larger than either harbor, from the sea. Two weeks ago, we visited Birdling’s Flat which can best be described as a pebble beach. Rockhounds come here to find agates and geology students from UC to identify rock samples. My geologist son-in-law explained to me that this vast accumulation of rock was deposited by a tsunami. This entry was posted in New Zealand, South Island, travel and tagged geology. Bookmark the permalink.